Finally the release date of 'Agent Vinod' has been fixed. The long-delayed Saif Ali Khan production venture 'Agent Vinod' has been completed and will release on March 23. Saif Ali Khan and Kareena Kapoor shot for the last day of Agent Vinod on December 24. The post-production work is still on and the film is on the editing table. Now that the movie is out of the way, fans can hope that Kareena and Saif will finally tie the knot. The Kareena-Saif wedding is likely to be held in the last week of March or the first week of April. Reportedly Saif Ali Khan is all set for his big fat wedding. The actor has apparently chosen a 4-5 carat diamond ring for Kareena. He placed the order for the big diamond ring at a Bandra-based jeweller. Kareena Kapoor is also gearing up for the big day. Designer Ritu Kumar, who is an old acquaintance of Sharmila Tagore, is busy assembling the wedding trousseau for Kareena. According to India Today, Kareena requested Madhur Bhandarkar to shift her schedule for 'Heroine' from the end of February to the middle of February. This is to accommodate the promotion and release of'Agent Vinod' into Kareena's clogged schedule, followed by the wedding and honeymoon. 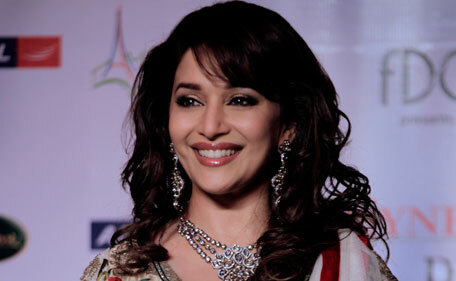 Madhuri Dixit-Nene is the latest Indian film star set to join the A-list line up at Madame Tussauds London. Madhuri, famed for her dazzling dance and million-dollar smile, has already given a sitting to the sculptors in Mumbai and is expected to unveil her likeness here in London in March. The decision to include Madhuri is set to delight Bollywood fans around the world as Madame Tussauds was constantly inundated with requests to feature Madhuri. Madame Tussauds released a statement saying: "Her figure will make a stunning new addition to our Bollywood area which continues to grow in popularity every year. With so many awards to her name and a career spanning over 25 years she undoubtedly deserves her place here and huge interest is expected in the figure when she takes up residence later this year!" "Madame Tussaud's made the announcement and I am confirming it. Will be in London in March to introduce my likeness! Thanks for all ur support," tweeted Madhuri. To ensure total authenticity, Madhuri will be closely involved in the creation process, collaborating with the team to agree to the pose and even donating a Manish Malhotra sari for her figure to wear. Her hair will flow loosely over her shoulders, styled to show off her long tresses to full effect. Madhuri’s figure will be in good company at Madame Tussauds London joining five of the biggest names in Indian cinema – Shah Rukh Khan, Aishwarya Rai, Hrithik Roshan, Salman Khan and Amitabh Bachchan. The figure will cost £150,000 to create and take a team of sculptors, hair, makeup and wardrobe experts four months to create. It seems like actress Kareena Kapoor wants to add another designation in front of her name, - that of a director. Well, Kareena has recently directed a scene in her next movie, 'Ek Main Aur Ekk Tu'. She and co-star Imran Khan had to do a scene where both the stars are in Las Vegas and both are drunk on the streets. The director Shakun Batra narrated the sequence to the actors but was not sure of about how to execute it. Apparently, he wanted natural reactions from the public without anyone realising that they were being filmed. However Kareena took charge and shot the full sequence without taking any help from the director. She did some rehearsals with Imran and the two were good to go. The onlookers were obviously taken by surprise at the drunken act of the two stars. Shakun liked the end product and was quite happy with it. There seems to be another director in the making from the Kapoor family. Refusing to get lost in a male-dominated film, Vidya Balan refused to sign Sanjay Gupta's 'Shootout At Wadala'. Vidya who has been hugely applauded for her fabulous act in 'The Dirty Picture' doesn't want to do male-dominated fillms anymore. Though Ekta Kapoor is producing the movie and Vidya wants to work with Sanjay still she opted out from the project, reported Zoom. Both Vidya and John Abraham had reportedly decided to work together in Sanjay Gupta's 'Shootout At Wadala', after five long years since their alleged romantic liaison during the making of 'Salaam-E-Ishq'. However, the actress has now decided to opt out of the project. And not because of her male co-star. Vidya, after her successful portrayal of Silk Smitha in 'The Dirty Picture', is not too happy playing second fiddle to a male lead. The actress has raised the bar of female dominated films in the Bollywood. Vidya wants to do roles that prove her as an ace actress time and again. 'Shootout At Wadala' is a male dominated one and Vidya had to play Manya Surve's girlfriend - the role played by John Abraham. Vidya, for sure is making all the right decision.